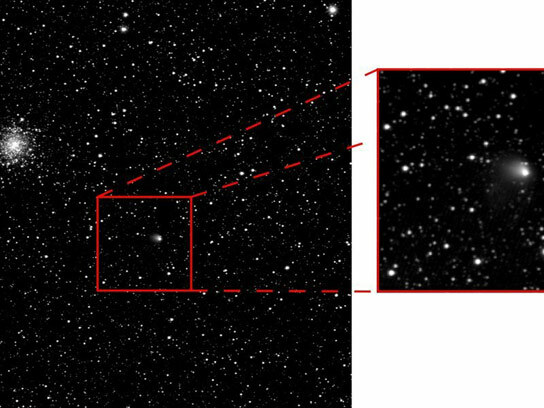 European Space Agency’s Rosetta spacecraft witnesses the awakening of the mission’s target comet. The comet 67P/Churyumov-Gerasimenko, target of ESA’s Rosetta mission, has begun to develop a dust coma. This can be seen in a series of images taken by OSIRIS, the spacecraft’s scientific imaging system, between March 27th and May 4th. In the images from the end of April, the dust that the comet is already emitting is clearly visible as an evolving coma and reaches approximately 1300 kilometers into space. Scientists from the OSIRIS team presented these new findings in a meeting at the Max Planck Institute for Solar System Research (MPS). Still more than 600 million kilometers separate 67P from the Sun. This corresponds to more than four times the distance between Earth and Sun. This early onset of cometary activity offers scientists the opportunity to study dust production and structures within the coma at an early stage of the mission. “It’s hard to believe that only a few months from now, Rosetta will be deep inside this cloud of dust and en route to the origin of the comet’s activity”, says Holger Sierks. Be the first to comment on "ESA’s Rosetta Spacecraft Witnesses the Awakening of the Mission’s Target Comet"